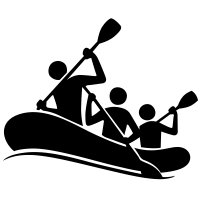 We are the #1 local outdoor adventure company located in Baja California, Mexico. 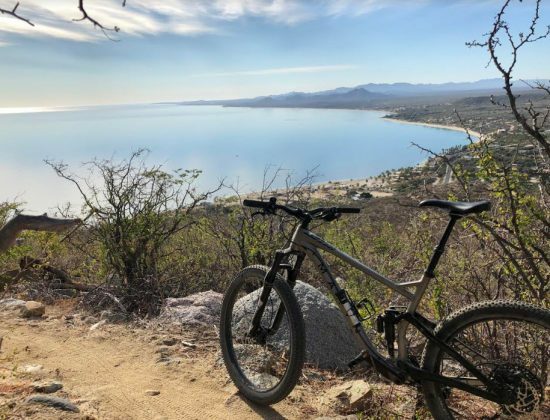 Our mountain biking tours and hiking adventures extend from the beautiful white sand beaches of the Sea of Cortez to the majestic and rugged Sierra de la Laguna mountain range. Experience our unique tours that capture the essence of the sea and summits of Baja California Sur. 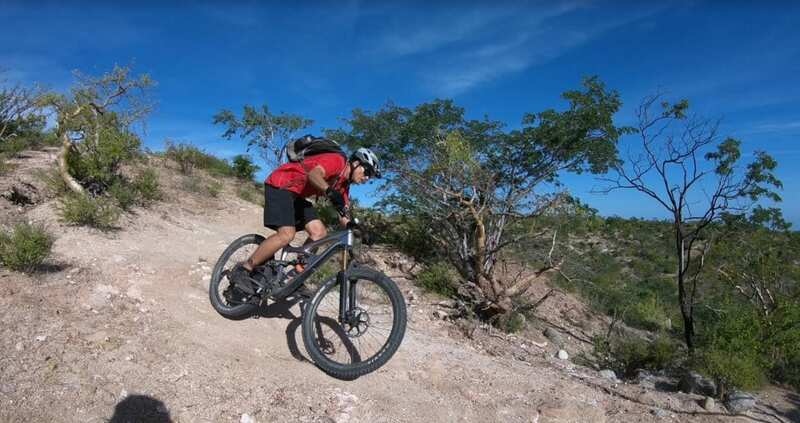 We are the experts in Baja California mountain biking and hiking! We have local, experienced guides that know the area intimately, some of whom helped to build the trails we use. Our attentive guides are knowledgeable about natural history and historical facts of the area. They will ensure that your tour with us is memorable and unique. We measure our business success in smiles. Our mission is to leave a lasting impression by delighting our customers with personal, friendly, and attentive service, easy online booking, and an incredible experience in Baja, Mexico. We are a family run business woven into the fabric of the Baja California Sur area. 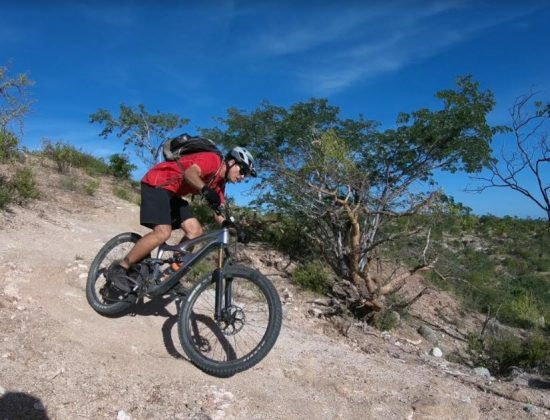 We have a new tour featuring our fleet of electric mountain bikes. For those who have less time, tired legs, or just want a little pedal assistance – try an E-Bike and enjoy the ride! Click Here to book one of the hiking adventures described below. Description: Join us for one of the best Eco-Expedition guided hiking trips in Baja! We hike on a rugged trail crisscrossing a beautiful stream several times to a deep pool surrounded by cacti, palm trees, and lots of canyon flora in the water oasis. This spectacular sanctuary is hidden in the heart of La Zorra Canyon at the base of the Sierra De La Laguna Biosphere Preserve. Starting Point: Your confirmation will provide a precise meeting time, place, instructions, and transportation options. Top Features: Hike through the arroyo, observe unusual stream patterns, explore a beautiful canyon filled with boulders, unique flora and fauna, break at waterfalls, climb rocks, take pictures and head back before dark. Starting Point: Your confirmation will provide a precise meeting time, instructions, and transportation options. Description: We hike up a steep-walled arroyo with abundant greenery over granite boulders and slabs to numerous small waterfalls. We will basque in the tranquility of this scenic arroyo surrounded by mountains and enjoy the views of the sea on our way back. Slot canyon unlike any other in the area! Description:We start in Buena Vista and hike towards our local singletrack trails through a surprisingly diverse assortment of desert foliage. We hike down into a scenic slot canyon, unlike any other in the area, take a short break, and follow that around to the sea, where we will finish the hike on the beach. You’ll be rewarded with a margarita or cold beverage at the end of your hike! Description:We start the hike right from the famous Barrels of Los Barriles. We begin one of several hikes and bike trails making a steep ascent to the ridgeline. 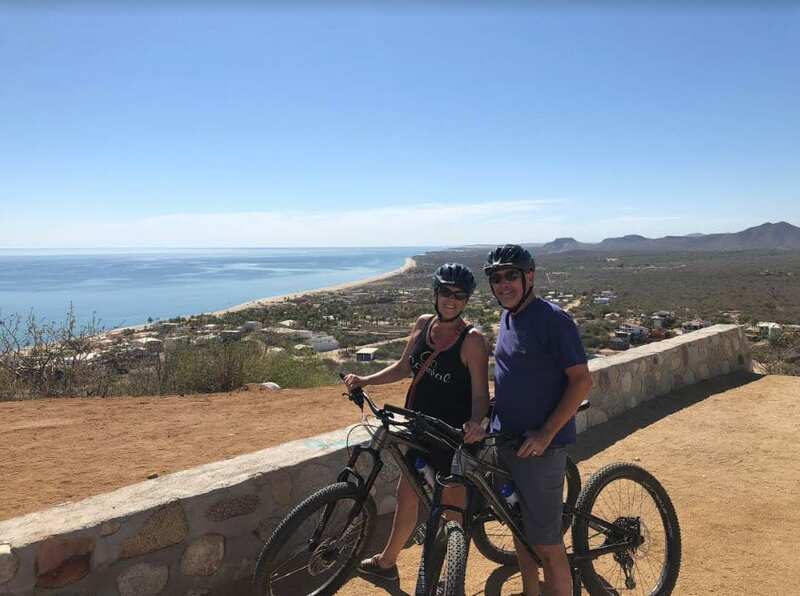 At the top the view is breathtaking, we will continue to the ridgeline with constant views of the mountains, the water, and Baja sunrise/sunset! $75 cancellation fee when canceling 61 or more days before your trip. $250 cancellation fee when canceling 45-60 or more days prior to your trip. 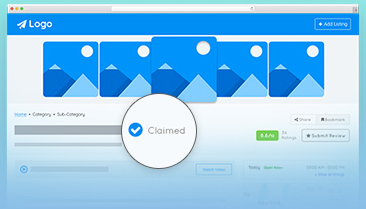 50% cancellation fee when canceling 14-44 or more days prior to your trip. No refund for cancellations within 14 days of your trip. Important: Guests can reschedule for another trip in the same season or the following year only. Personal emergencies do not void cancellation policy and biking tours go rain or shine. Travel insurance that covers trip cancellation or trip interruption is highly recommended. If we are able to re-sell your spot on a tour, we will refund you the full tour amount minus a $75 fee. 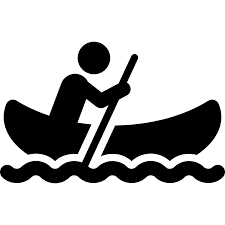 Q What is the skill level required for your tours? We don’t do beginner rider tours. Intermediates will find lots of enjoyable terrain and there are plenty of places to challenge advanced riders! We are located in Los Barriles, one of the most beautiful places in Mexico. Buena Vista recently noted as one of the best places to live in Mexico. Outside magazine just named Los Barriles as of the best beaches in the world. Q Is Los Barriles safe? Its very safe here! This area began as a small fishing village and has morphed into a small winter tourist community with a very chill vibe. Q Does Los Barriles have nightlife? The weather is mild, dry and windy during the winter time. Expect lows in the mid 50’s with highs in the 70’s and low 80’s.